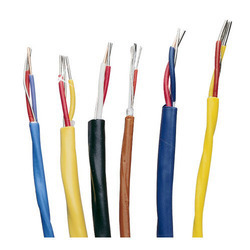 We are one of most sought manufacturer and supplier of Thermocouple Extension Cable. These thermocouple cables can also be termed as instrumentation cables since they are used for process temperature measurement. The construction is similar to pair instrumentation cable but the conductor material is different. Thermocouples are used in processes to sense temperature and is connected to the pyrometers for indication and control. We are offering Thermocouple Extension Cable to our clients.